Thanks to my wonderful job, I attended a course on ‘garden shed brewing’ at Whitehawk Community Food project where we learned that home brews can be made with simply fruit, water and sugar – no need for scary chemicals like pectolase and campden tablets or sterilisers. Nor do you need to buy one of the dizzying variety of wine yeasts – most fruit picked outdoors has wild yeast on it which will activate in warm, sugary water. The yeast turns the sugar into alcohol through ‘fermentation’ and then you have wine! I couldn’t wait to get started. Thanks to all the foraging and friendly people with fruit trees I haven’t had much trouble finding fruit to use. I picked some blackberries at Stanmer Park to make my first batch of wine and then I was given a large bag of plums (which are fermenting in a bucket right now). 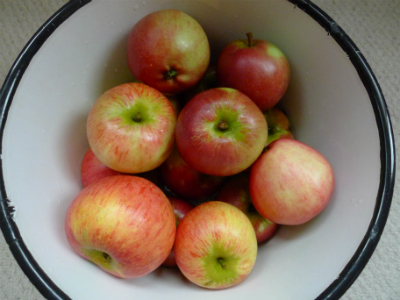 While all that wine was brewing, I also picked a bunch of apples at a friend’s allotment. I needed another way to use the apples up – so I decided to try making ‘fruit leather’. Fruit leather is a sort of natural ‘fruit roll-up’ – a sheet of dried fruit with a chewy texture and you can make it with almost any fruit. 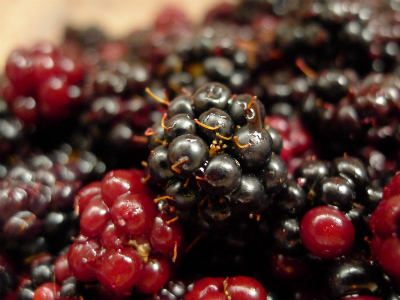 Blackberries or currants might need pushing through a sieve to remove the hard seeds or stems, and try combining different fruits – like blackberry and apple or apple and plum. Its a great way to preserve gluts of fruit and it makes a naturally sweet and healthy snack – check out the second recipe below and give it a try. Wash the bucket with very hot soapy water and rinse well. Things like bacteria or even just one vinegar fly can ruin your wine so you really want to get everything that touches it as clean as possible. Combine the tea, water and sugar in the bucket and stir until the sugar is dissolved. Then add the lemon juice and blackberries and mash with a potato masher to break up the fruit. Then cover with a lid. Too much oxygen can ruin your wine, so keep the lid on nice and tight – the fermentation will create a layer of carbon dioxide which will protect your wine from any oxygen at the top of the bucket. Check the brew once a day to stir and see if it is fermenting (see the photo above for an example of this – you should see froth and bubbles in your mix). The bucket should be at a nice, warm room temperature – cover the bucket with a blanket or towel if you think it might be too cool. If it doesn’t ferment after about 24-48 hours, you can add a pinch of bread yeast to get it going. 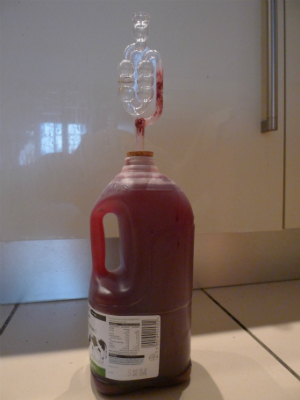 After three days, remove the berries and strain through muslin into a demijohn or clean milk bottle. Seal with an airlock that has been partly filled with water. 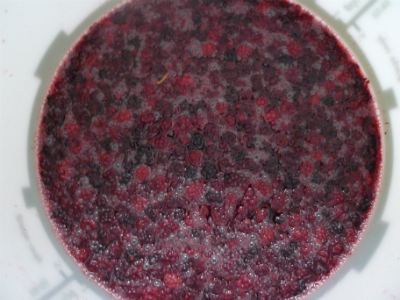 You can see how the wine is fermenting in the speed of the bubbles of carbon dioxide coming through the airlock. After a couple of months (when fermentation is very slow or stopped) it can be decanted into old wine bottles with screw-top lids (leaving behind any sediment) and enjoyed! Although the longer you can resist and leave it to age, the better the flavour. Core the apples and cut into 1-inch pieces. If you have a food processor you can leave the skins on and blitz the puree later. If you don’t have a food processor you probably want to peel the apples. Cook the apples in a large pot over medium heat. If they are too dry add a little splash of water. Stir regularly and reduce the heat as needed until the apples have softened into a puree that looks like applesauce. This should take about 30 minutes. Test the mix and add sugar and lemon juice to taste – adding a bit of each will brighten up the flavour, but adjust the quantities based on the sweetness or tartness of your apples. Then add any spices. If you left the skins on you can now blitz in a food processor as you want a smooth texture. 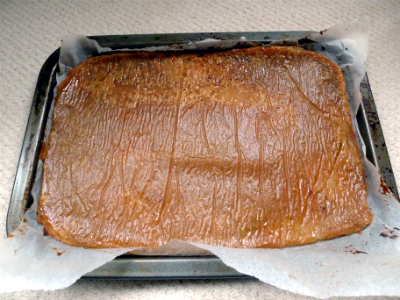 Place a piece of baking paper on a baking sheet and spread the mix on top. You want no more than 1/4 inch thickness and you can make it level with a spatula or the back of a spoon. Cook on a low-heat (about 60C) until the fruit has dried to the texture of beef jerky – about 3-4 hours but it could take longer depending on your oven. Store by wrapping in the baking paper and keeping in the fridge for up to a month or in the freezer for up to a year. Hi, I like the idea of apple leather, much healthier than buying a ready processed version. Might give that a go sometime. I dont know if it would work with dessert apples – the ones I get always seem to hold their shape when stewed, they dont mush down. Hi Sarah, I used eating apples when I made it so you might need to add more sugar, cook a bit longer or blitz in a food processor with cooking apples but I reckon it should still work. I’d love to know how you get on and thanks for reading!